Rabiah-Nassar and Zamil concrete industries is a joint venture between two major Saudi companies , Rabiah & Nassar Group and Zamil Industrial. Rabiah-Nassar and Zamil Concrete Industries is a trusted name for more than three decades for pre-stressed / precast concrete systems and is a pioneer in the field with many landmark projects. Known for its engineering capabilities and uncompromising quality in delivering complex structures with excellent architectural finish Rabiah-Nassar and Zamil has executed many prestigious projects for schools, university buildings, hospitals, hotels, commercial buildings, wedding halls, malls, industrial & residential buildings, wide span buildings and bridges. As part of continuous endeavour to adopt latest technology Rabiah-Nassar and Zamil built a new state of the art manufacturing facilities for concrete batching & mixing plants, hollow core slabs production lines , and a circulated pallet factory for panels. Rabiah-Nassar and Zamil is maintaining its leadership position in the precast industry in the Kingdom of Saudi Arabia, through technological and project management capabilities delivering best value to customers. Pre-stressed L-Beams , Inverted T Beams & I- Beams. Pre-stressed Single & Double T Slabs. Circular & Rectangular columns in many different dimensions. With many types of thicknesses up to 50 cm. Different types of parapets with many shapes & Dimensions. Many types of precast foundations. 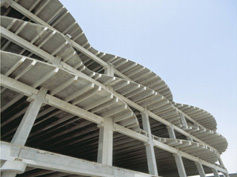 Standard & Non-Standard precast staircases. precast form & Solid slabs with different spans and thicknesses. Different types of precast trenches for drainage and sewage purposes. precast open and box culverts with different standards. Manholes & Handholes used as maintenance and inspection chambers. Precast water tanks used above & under the ground. Different types of boundary walls with precast foundations & Columns. Single & Double Faced Barriers. Precast Benches as street furniture. With many shapes and designs . Precast Trash boxes as street furniture.